UNC Center for Transplant Care utilized kidney paired donation, connecting strangers from across the country, to help a mom save the life of her daughter. A patient prepares for surgery. Blood is drawn, vital signs are checked, and lab work is completed. Now there is only to wait for the moment they will be wheeled into the operating room. Bright white lights exposing their abdomen, doctors working quickly and efficiently to remove one of their kidneys; not because they have suffered a trauma or because of an illness, but instead to save the life of another. Through a kidney paired donation an individual chooses to donate their kidney which will remarkably not go to a loved one, but to a complete stranger. The surgery is the beginning of what’s called a kidney chain, an interconnecting, linked chain of individuals in need of a kidney transplant. It begins with a person in need, Recipient A, and a person who wants to donate a kidney to them; maybe a loved one or friend but who has been deemed an incompatible donor. That donor is referred to as Donor A. The chain then stretches across states, time zones and thousands of miles as the first donor completes their surgery and kick starts a domino effect that takes hundreds of hours to organize and bring to fruition. There are approximately 100,000 people on the deceased donor kidney transplant waitlist, many of whom wait 5 to 10 years before their name is called to receive a kidney. 5,000 people die each year waiting for a transplant while another 5,000 are removed from the list because they are no longer healthy enough to receive a transplant. So what are the alternatives? 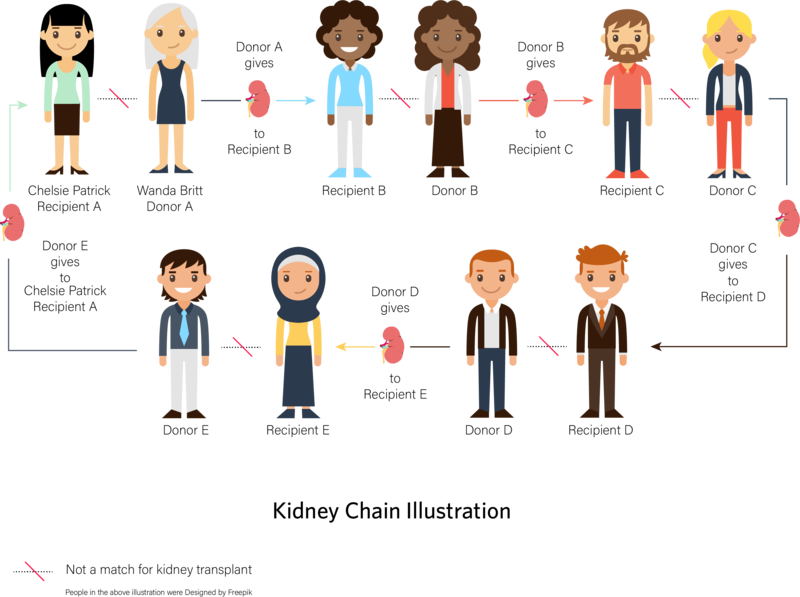 Kidney paired donation is the exchange of kidneys from living donors who are deemed incompatible with their intended recipients. The UNC Center for Transplant Care registered Chelsie as a recipient and her mother Wanda as a donor to the National Kidney registry list. The National Kidney Registry (NKR) is a nonprofit that helps facilitate living donor kidney donations around the country, building complex chains of kidney swaps by matching compatible donors with patients needing a transplant. Since they started in 2007, they have helped facilitate over 2800 kidney transplants. In early December the UNC Transplant team was contacted by NKR letting them know matches had been identified. The hospital responded within the 24-hour time frame, and the process moved forward into the logistical and planning phase. The Surgical team along with Wanda’s advocate and health care champion Dr. Karin True, Assistant Professor of Medicine in the division of Nephrology and Hypertension at the UNC Kidney Center felt that it was not in Wanda’s best interest to move forward. They instead decided to spend the time to figure out why she was so anemic and how they can correct it. However, hope was not lost. So, in the end, Wanda was not the first donor in the kidney chain, but the last. The rest of the surgeries continued on that day allowing Chelsie to receive her kidney on October 25th. Wanda then became what’s referred to as a bridge donor, meaning she would donate her kidney at a later time. Over the next few months, as Chelsie got stronger and recovered from surgery, Wanda regularly came back to the UNC Center for Transplant Care to receive iron infusions. Finally, on December 12th Wanda donated her kidney to the intended recipient.